Like players who've proven they can dominate minor-league hockey but have trouble finding a regular role at the top level, Austria and Slovenia have experienced plenty of success at the Division I level of international competition but have had trouble defending their spots at the elite level once they get there. After winning gold medals in their respective IIHF Division I World Championship groups in April, the Austrians and Slovenians have 10 months to prepare to play the world's best hockey countries at the 2011 World Championships in Slovakia. It won't be easy, as there is a lot of work to be done between now and then. In order to avoid the typical fate of teams jumping a grade of competition -- which usually turns into relegation the following year -- both Austria and Slovenia will have to elevate their games higher than they did at the 2010 Division I tourneys. It's a challenge that neither nation has had much success in conquering. In Slovenia's case, the national team's victory on home ice in this year's tournament ended a two-year stint in Division I since its last crack at the elites. Austria will be back after a one-year absence. Even at the Division I level, when Austria or Slovenia do not have their best players available -- the Buffalo Sabres' Thomas Vanek or Los Angeles Kings' Anze Kopitar, respectively -- they play a caliber of hockey that's closer to their top challengers in the Division I pack than to the average non-medal-round teams at the elite level. The top two forward lines and top defensive pair are a jump from the typical grade of Division I talent, but the remainder of the roster is unremarkable. Between the two countries, the Austrian hockey program is somewhat better than its Slovenian counterpart on an overall player-development basis, but the Slovenians arguably have the more promising young core of talent for the future. In both cases, however, the nations have trouble retaining their best young players. Typically, the top Slovenian and Austrian junior talents must go elsewhere in Europe (usually Sweden or the Czech Republic) or to North American junior or collegiate hockey to find a suitable caliber of competition. This experience is taken back to their respective national teams at the senior level but most of their fellow players who remain home throughout their hockey development do so because they are not talented enough to be recruited by a program in an elite hockey nation. For right now, the Austrians and Slovenians can look at what went right at the Division I tourney and which areas they need to improve. The Slovenians had the advantage of being the host nation for their bracket of the 2010 Division I Worlds. In a tournament that also featured top challenger Hungary, Great Britain, Poland, South Korea and relegated Croatia, the Slovenians played to partisan home crowds that more than doubled the size of the audiences that turned out for games between the other participants. 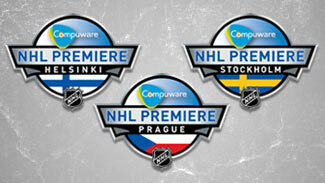 For the fourth straight year, NHL Premiere will bring NHL teams to hockey hotbeds in Europe. Even without the services of Kopitar, who was involved in the first round the Stanley Cup Playoffs at the time of the tournament, Slovenia had the advantage of being able to send out two formidable forward lines dominated by young talent. The line of Ziga Jeglic (2 goals, 9 assists), Rok Ticar (7 goals, 3 assists) and Jan Urbas (2 goals, 5 assists) combined to score 11 of the 29 goals the Slovenians tallied in the tournament, placing first, second and sixth among all skaters. Detroit Red Wings prospect Jan Mursak held down the fort on the second line, ranking fourth in tournament scoring with 5 goals and 7 points. His linemates were brothers David and Marcel Rodman. The 20-year-old Ticar played this season in the Austrian-dominated Erste Bank Eishockey Liga for Slovenian team Acroni Jesenice, for which he scored 13 goals and 28 points in 45 games. The center spent the previous two seasons playing for Timra IK in Sweden's Elitserien and top Under-20 league. Jeglic, 22, is Ticar's teammate on Jesenice. He scored 9 goals and 22 points during the EBEL season. The 6-foot-3 Urbas, 21, formerly played in Sweden for the Malmo IF Redhawks. Mursak, 22, was a sixth-round draft pick by Detroit in the 2006 Entry Draft who opted for the junior hockey route in the Czech Republic and Ontario Hockey League. He spent the 2009-10 season in the AHL with the Grand Rapids Griffins, for which the right winger had 24 goals in his second professional campaign. The 28-year-old Marcel Rodman, a former draft pick of the Boston Bruins (ninth round in 2001), played OHL junior hockey before returning to Europe, where he now plays for Vienna in the EBEL. He scored 21 goals and 50 points in 50 league games this past season. David Rodman, 26, played junior hockey in the Quebec Major Junior Hockey League before going back to Europe. He played in the EBEL for Vienna during the 2009-10 season, racking up 27 goals and 70 points. Led by these six players, Slovenia boasted a 5-0 record at the Division I Worlds, but it wasn't always easy. The Slovenians did not play especially well in beating Poland, 3-2, in the opener and were not suitably challenged by the tourney's weakest team, Croatia, in a 10-1 romp in the second game. In the third game, the Slovenians shut down their engines a little too early, blowing third-period leads of 2-0 and 3-2 to Great Britain before Ziga Zeglic's overtime goal saved the day. The Slovenians then played a more focused 60 minutes of hockey in dispatching South Korea, 8-3. That set up a final-day showdown with previously unbeaten Hungary for the right to play in Slovakia at the 2011 Worlds. Slovenia showed itself to be the better team, going on to win 4-1 behind a two-goal effort from Ticar and a Mursak tally. Success on the power play played a big part in the Slovenians' success at the Division I Worlds. The team went 7-for-28 on the man advantage to rank first among the six teams in the field. The penalty kill was not quite as strong, ranking fourth at 82.6 percent (19 of 23). If the Slovenians are to have any chance of avoiding relegation come next spring, it will be critical for the club to pick up the pace when it is playing shorthanded. Unlike the Slovenians, the Austrians had to leave the comforts of home to earn their Division I gold medal and return to the elite level. In an overlapping tournament played in Tillburg, Netherlands, the Austrians posted a 5-0 record against a field of Ukraine (the Austrians' most viable challengers), the host Dutch team, Lithuania, Japan and relegated Serbia. Austria had a glorified tune-up game in the opener, drawing Serbia. The Austrians ended the suspense quickly, going on to rack a baker's dozen worth of goals in a 13-0 romp. The Lithuanians provided somewhat tougher opposition, but the Austrians still breezed, 6-2. In the third game, Austria took on a pesky Japanese team that played strong team defense and featured one-time Los Angeles Kings goalie Yutaka Fukufuji. Austria goalie Reinhard Divis, a former member the St. Louis Blues, bettered the play of his Japanese counterpart and Austria sweated out a 3-1 win. The Austrians then got past the Netherlands, 4-1, to set up a final-game meeting with Ukraine for the gold medal and promotion. In the decisive game, Austria took an early 1-0 lead on a Thomas Raffl power-play goal and then nursed the slim advantage until midway through the third period. The least-penalized team throughout the tourney, the Austrians found themselves in penalty trouble for much of the latter part of the game against the Ukrainians. After Ukraine tied the game on the man advantage at 10:06 of the third period, Austria answered right back just 1:49 later. Moments after forward Oliver Setzinger (1 goal, 9 assists in the tourney) was denied on a breakaway, the tournament's top-scoring defenseman, Matthias Trattnig (3 goals, 6 assists), put his country back on top to stay. In order to hang on for the victory, however, the Austrians had to survive a five-minute penalty kill after David Schuller was given a major penalty and game misconduct for boarding longtime AHL defenseman Sergei Klimentiev. In the waning minutes, the Austrian penalty killers blocked several shots and Divis took care of the rest. Much of the victorious Austrian roster was comprised of EBEL and Swiss National League players. Three of the top seven scorers in the tournament were Austrians. Left winger Setzinger, a former Nashville Predators prospect who played part of one season in the AHL before returning to Europe to play in Switzerland, ranked third. Forward Thomas Koch, who previously played in Elitserien and stockpiled 24 goals and 78 points in the EBEL this season for Salzburg, ranked fifth at the Division I Worlds with 5 goals and 9 points. Trattnig, who was once a Chicago Blackhawks prospect and has NCAA, Elitserien, AHL, and DEL experience, ranked seventh among all skaters. The 31-year-old has spent the last five seasons with Salzburg. Although Fukufuji was chosen as the top goaltender in the tournament, Divis did a fine job in his own right. In many cases, it's tougher on a goalie when he has to deal with long periods of inactivity rather than staying busy all game. Thirty-five-year-old Salzburg goaltender Divis, who appeared in 27 NHL games over parts of four seasons and has a wealth of experience in various European elite leagues, allowed just five goals in five games, shutting out the Croatian team and stopped 95.1 percent of the shots fired at him. As with Slovenia, Austria owed much of its success at the 2010 Division I Worlds to its power play. The Austrians ranked second in the tourney, converting 7 of 32 opportunities. On the penalty kill, Austria posted an 88 percent success rate, including the critical five-minute kill that secured its spot in Slovakia next spring.